1. Purpose. To provide guidance to Region Eight USAF MARS members for the purpose of supporting USAF and the State of Hawaii Emergency Communication (ECOM) requirements. MARS communication be realized. This plan was developed to outline responsibilities of the USAF State Mars Director (SMD), Net Control Stations (NCS) and affiliate MARS stations to support USAF Operation Plan 32-1 Disaster Preparedness, local military disaster response forces and civil authority ECOM requirements. 3. Situation. The State of Hawaii is susceptible to man made and natural disasters of such magnitude to warrant the activation of MARS to provide ECOM support. This support may be in the local area (Island of Oahu) or statewide. 4.1. State MARS Director (SMD): The SMD shall maintain a roster of USAF MARS affiliates with their phone numbers in the local and state area who can provide communication support as needed. Additionally this roster should list Net Control Stations capable of activating HF and VHF nets as necessary. A copy of this roster should be made available to the MARS membership. 4.2.1 The SMD should conduct periodic exercises to include field exercises. These exercises should be of varying scope and degree. The activation of HF voice/digital nets, mobile HF, packet networks, emergency power and mobile cross band capabilities should be exercised. The SMD should coordinate these exercises with the respective service SMDs to ensure inter-service MARS operations. 4.2.2 MARS Affiliates: Actively participate in USAF MARS exercises. Provide HF/VHF fixed or mobile communications as requested by the USAF SMD. Provide relay of military or civil health and welfare traffic to as required. Ensure current phone number, address, and operating capabilities are filed with the USAF SMD. As a minimum maintain a station capable of operating on MARS primary HF allocations and VHF voice and Packet nets. Emergency power is highly encouraged. 4.3 The USAF SMD may direct USAF MARS members to support other service MARS nets and frequencies as needed. See table 6.1 for sister service net control points of contact. The owning service MARS procedures will be followed at all times. 4.4. This plan should be reviewed annually or upon termination of ECOM support by the SMD and MARS membership to ensure currency. 6.1 Notification: Upon notification of a impending/sudden disaster through radio and television (Hurricane Watch, tsunami warning, earthquake, aircraft accident et) USAF MARS members should monitor USAF MARS HF, VHF Simplex and Repeater nets for possible activation.. 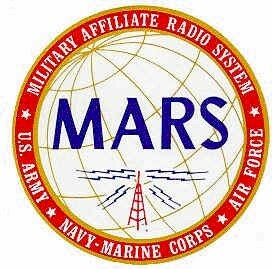 The SMD or any MARS member may initiate a telephone recall of USAF MARS declaring ECOM activation. MARS members declaring ECOM activation should also coordinate with the sister service Net Controls for joint support operations and coordinated ECOM condition declarations. 6.2 Full advantage of VHF packet networks, HF digital modes and if available e-mail should be utilized to enhance handling of message traffic. See attachment 1 for frequencies, locations and call signs of VHF voice, packet networks and nodes. 6.2.1 Digital traffic requiring forwarding to DOMS should be passed to a MARS station capable of forwarding traffic into the system by e-mail or digital MARS networks. This may vary depending on the situation. As an example, no commercial phone lines are available on Oahu, but a station on Maui may have e-mail available or vice versa. Traffic may also be passed to stations capable of receiving and passing traffic into the MARS digital networks on frequency 6775 khz (TVRS-3) HF packet in California, or Transcon PACTOR nets. Traffic may be passed to the Air Force PBBS (call sign AFA8DE) on 143.980 MHz so it can be picked up by HF digital capable stations. The key is to remain flexible and if time allows, notify CONUS MARS officials of possible net support requirements. 6.2.2. Essential Elements of Information (EEI) reports: All Air Force MARS members are asked to send EEI reports if they are aware of any disaster situation which could adversely impact life, limb or otherwise impede the public safety, regardless of how minor it may appear. This could include bridges or roads washed out, power lines down, wind or hurricane damage, heavy rains, flooding, etc. 6.2.3. EEI'S are advisory information used by DOMS to make an assessment on what emergency action, if any, should or needs to be taken; and how best to proceed given the variables obtained from EEI reports. The more EEI information thats available, the more effective the assessment by DOMS will be. 6.2.4. EEI reports should be as brief as possible and still convey critical information. Stations need to complete the entire form. If a paragraph is not applicable or information not available, state so (see attachment 6, 7). 6.2.5 Actual EEI reports should be sent via e-mail to: AGSTENOS@HQDA-AOC.ARMY.PENTAGON.MIL and FOXHOLE@DOMS.ARMY.MIL. Information copies should be sent to AFN1EC@AOL.COM. 6.2.6. Get EEI reports out as soon as possible after receiving the information. 6.2.7 Notify the SMD AFF8C when EEI reports are sent to ensure SMD is aware that reporting is being accomplished. ECOM ALERT (READINESS) CODES: The ECOM CONDITION CODES serve the same function as the WARNORD & OPORD. These are considered authorization to implement the ECOM actions directed by each condition. Conditions exist that may develop into potential emergency/disaster situations over the next few days. NOTE: This is primarily used for potentially severe weather ALERTS issued by the National Weather Service and should be used any time severe weather is predicted. * Stay Alert to News and Weather reports for potential problems. * Be prepared to change ECOM Conditions to higher Readiness levels. * Monitor USAF MARS HF, VHF Simplex and Repeater nets for possible activation. An emergency or disaster situation is expected to develop within 48 hours. * Activate the Telephone Alerting System. Ensure that all members are aware of the potential emergency/disaster situation. * Take preliminary precautions: Test emergency power, locate essential equipment and supplies, review ECOM Plan, etc. * Continue normal MARS operations and REMAIN ALERT. * Continue preparing for ECOM operations. An emergency or disaster situation is anticipated within 24 hours. addition to actions taken in ECOM Condition 3). * Maintain close contact with State and Region Officials for guidance and up to date information. * Monitor regular and/or ECOM nets for updated information. * Take appropriate actions to protect family and property. * Establish Regularly Scheduled Broadcasts of updated information regarding the potential emergency/disaster situation. An emergency or disaster is imminent. * Suspend all normal operations. * Activate All ECOM Networks (NETS) and ECOM Plan(s). * Take final actions to protect family and property. * Check-in to ECOM Nets and monitor (Guard) closely. and be prepared to help as needed. An Emergency or Disaster situation exists. * Same actions as ECOM Condition 1. * Ensure that all available ECOM Nets and systems are in full operation. * Provide ECOM assistance to Local and State and Federal Emergency management Agencies as needed. 6.3.7. Any member may initiate an ECOM ALERT Condition in the absence of the SMD, or Region officials; however, attempts to contact these designated authorities shall be made prior to and after a member initiates the Alert Condition. The member initiating the Alert Condition is also responsible for ensuring that the telephone Alerting system and ECOM Nets are activated if applicable. 6.3.8. When broadcasting Alert Conditions, ensure that the geographical areas that are or may be affected are identified. Unless an emergency or disaster situation is local and requires no outside support, ECOM Alerts are applicable to the entire region. Actions taken by stations outside the emergency or disaster (effected) area may vary. 6.3.9. When ALERT CONDITIONS are no longer required, Broadcast ECOM CONDITION 5 to notify Stations to resume normal operations. 6.4.1. Activate the alerting process to ensure that all affiliate members can be prepared and will monitor for further information and instructions. This will make the OPORD (ECOM Activation) notification much easier. Army/Navy-Marine Corps ECOM Frequencies for further information. 6.4.4. Major Emergency/Disaster operations involving Joint Services MARS organizations will normally be preceded by an OPERATIONS ORDER (OPORD). The OPORD is an ECOM Activation Order, authorizing and directing ECOM operations by MARS. This OPORD should be formatted similar to the ECOM Plan and edited to provide only the specific guidance, based upon available information, needed for the ECOM Operation. Use the ECOM Plan as a reference and further guidance. 6.4.5. The ECOM CONDITION (READINESS) CODES (Section 6.3.1) serve the same function as the WARNORD & OPORD. These are considered authorization to implement ECOM actions IAW the ECOM CONDITION CODE (4-0) and actions identified in each. Not all emergency or disaster situations will be preceded by a WARNORD or OPORD, especially when situations occur with no prior warning, such as man-made disasters or emergencies. 7.1. Accurate and complete logs will be maintained in order to account for USAF MARS participation in any operation, as well as serve as a key source of information for review and analysis of USAF MARS effectiveness in providing the tasked communications support. Logs should include Message counts (transmitted/originated & received) and any pertinent information (See attachment 5 for format). 7.2. Net participation reports will be submitted to the SMD as soon as possible after termination of an operation or exercise by the Net Control Station(s). 8.1. Upon termination of ECOM support, MARS NCS should forward activity logs to the USAF SMD (see paragraph 7.1 for content). If requested by HQ USAF MARS, logs should be used to compile a After Action Report. 8.1.1 It is recommended that participating MARS Affiliates conduct a hot wash as soon as feasible after termination of ECOM support. Use this opportunity to critique MARS ECOM support and areas for improvement. Areas for improvement should be incorporated into the ECOM plan. time severe weather is predicted. 5. Communications: (Frequency being monitored or used. Callsign of NCS (if any). Callsign of the emergency/contingency station(s) presently offering support. C. (STATUS OF LOCAL TRANSPORTATION FACILITIES) Indicate which Roads are affected and status - open, restricted, closed, damaged, destroyed. Which Bridges are open restricted, damaged, destroyed. What is local airport and status - open, restricted, destroyed, unknown. What is the local railroad and status - operating, restricted, destroyed, unknown. The objective is to provide enough information to disaster relief officials to aid in deciding how to get assistance into the affected area. D. (EXACT LOCATION AND CHARACTERISTICS OF DAMAGE) General Description of Damage or impact of incident on Major structures such as Government buildings, Schools, Residences, Commercial Property, Public Facilities, Fire Stations, Etc. Include location of shelters if applicable. E. (STATUS OF AREA UTILITIES) Gas, Water, Commercial Power, Sanitation Systems - Operational, Damaged, Destroyed, needed. G. (SOURCE OF INFORMATION) Indicate Source of information if different from Date Time Group of the message. Include MARS Callsign, name of official and agency, radio/TV station Callsign or network as applicable. H. (REMARKS) Include Comments about expected changes in status of any of the above items such as Power Companies expect power to be out for more than how many hours. If applicable, include expected time of next report. NOTE: EEI Messages should be sent VIA E-MAIL if available or PACKET to the address as follows: AGSTENOS@HQDA-AOC.ARMY.PENTAGON.MIL and FOXHOLE@DOMS.ARMY.MIL, with info copies to: AFN1EC@AOL.COM and or FAX: 703-697-3147.
h. Rain expected for several hours. Roads expected to get worse. Potential for closing of many secondary roads possible later today. SPOT Reports are sent in response to requests from Emergency/Disaster officials requiring additional, up to date information on previous EEI Reports. Any INFO REQUEST made directly to a NET will be responded to by the NCS. E. WHEN ( GIVE DATE-TIME THE INFORMATION WAS COLLECTED) If UNK state so. EMAIL USED TO SEND ALL MESSAGE TRAFFIC TO REQUIRED DESTINATIONS.